Walk through any city and you're bound to stumble upon 'street trash.' Everything from boxes of discarded books and clothes to whole pieces of furniture can be found curbside. It's not a green way to declutter - but many people scoop up these unwanted treasures and make good use of them. Tel Aviv-based photographer Or Kaplan has been inspired by discarded street gems his whole life. 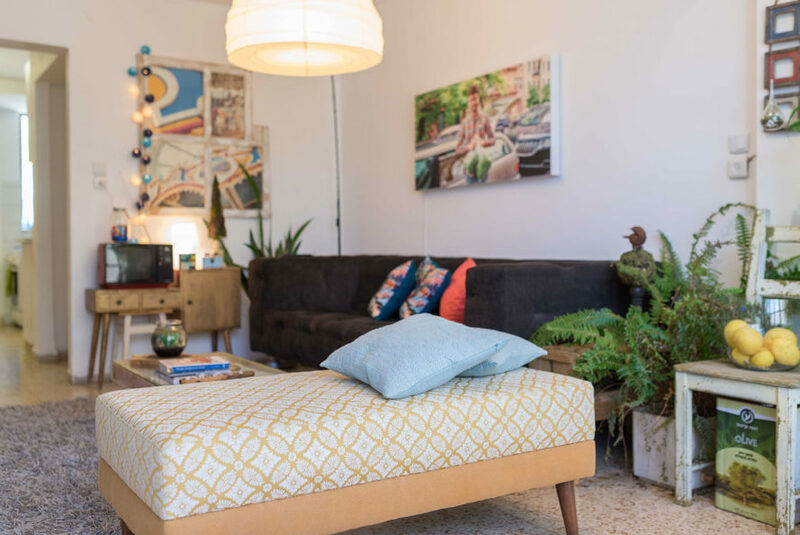 The DIY-extraordinaire has furnished most of his apartment with upcycled items from city streets, and he shows us just how beautiful and functional 'trash' can be. When Kaplan finally had his own apartment, he realized that all his dreams for creative upcycling could come into fruition. Instead of dropping big bucks at IKEA, he gradually furnished his entire home with found treasures. He fashioned a coffee table from abandoned wood scraps and a piece of glass, replete with draw storage and rope pulls. Wall shelving was achieved with antique army boxes and piles of old books. 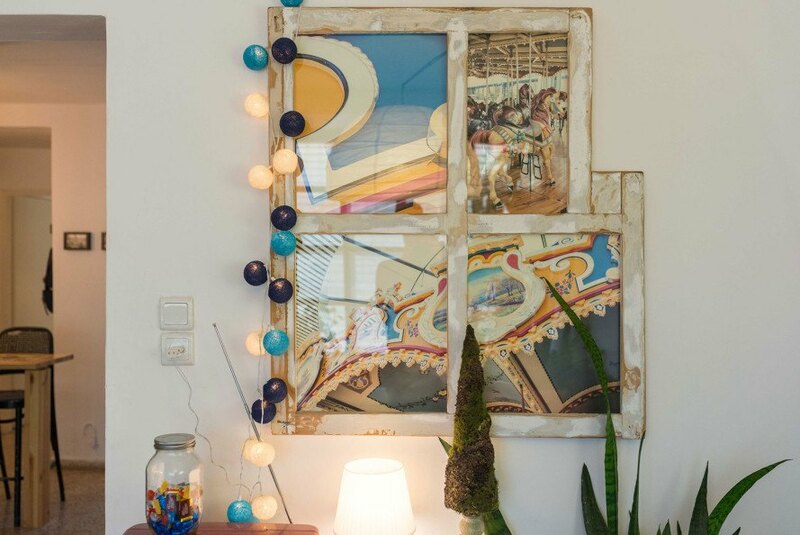 An abandoned window frame that Kaplan discovered in the garbage was reborn as a spectacular photograph display of a carousel in Dumbo, Brooklyn. And a retired florescent ceiling panel was transformed into artful wall lighting, Kaplan glossing over the lamp with a transparent photographic overlay. The pièce de ré·sis·tance, however, is Kaplan’s lush green wall. 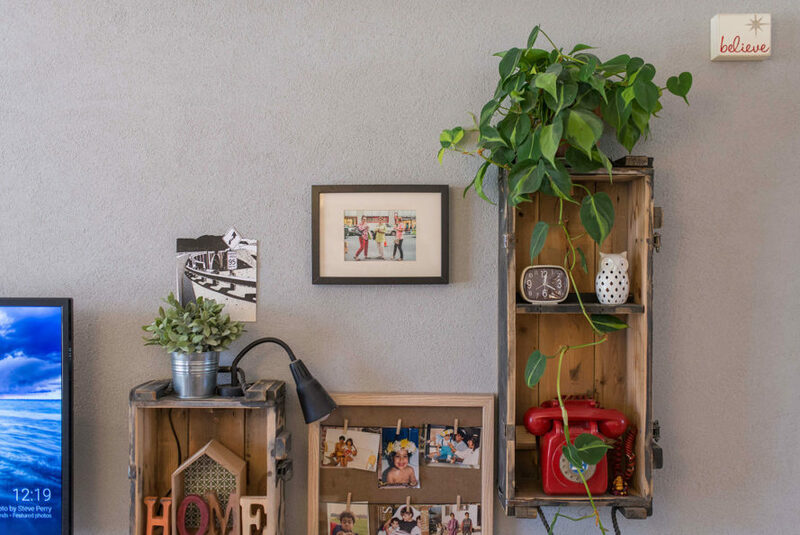 Made from scrap wood, chicken wire, old olive oil cans and a variety of plant species, his rustic statement piece invites magnificent green life indoors. Kaplan went to great lengths to improve his dwelling with minimal use of new objects and materials. 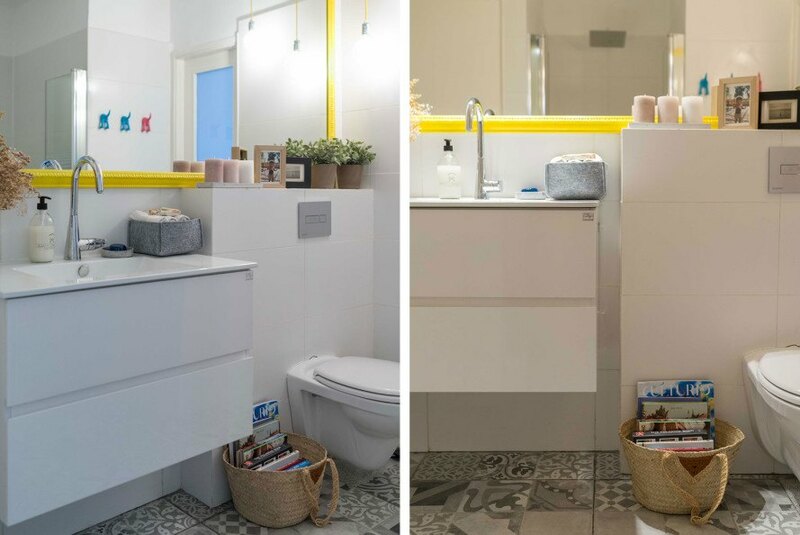 He even renovated his own bathroom with vintage tiles and a handmade lamp crafted from wire. The kitchen seating nook was constructed from wood and adorned with kitschy antique signs. This kind of artful repurposing has the power to inspire anyone. The next time you’re strolling down a city street, you may want to keep your eyes open – a treasure trove of endless possibilities awaits. Kaplan told Inhabitat, "I travel a lot around the world, and since I was a child I was creative about making things from other things," he said, "I would walk down the street and find things and think, 'What can I do with this?' It could be an abandoned tree limb, a box or even a book." Kaplan always had an eye for upcycling, even before it was a trend. The pièce de ré·sis·tance is Kaplan's lush green wall. 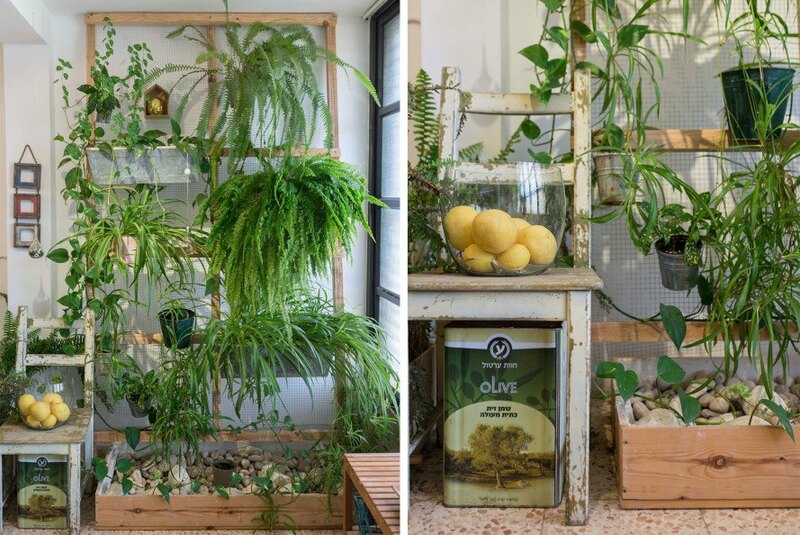 Made from scrap wood, chicken wire, old olive oil cans and a variety of plant species, his rustic statement piece invites magnificent green life indoors. An abandoned window frame that Kaplan discovered in the garbage was reborn as a spectacular photograph display of a Central Park carousel. 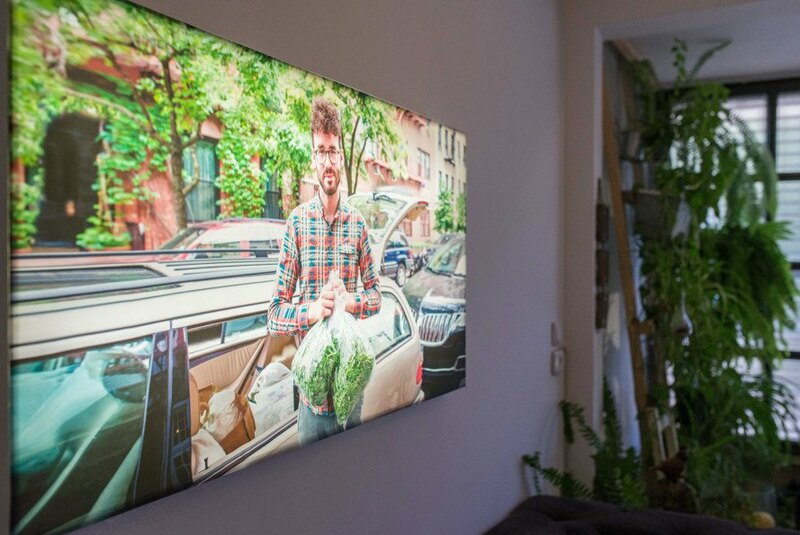 A retired florescent ceiling panel was transformed into artful wall lighting, Kaplan glossing over the lamp with a transparent photographic overlay. When Kaplan finally had his own apartment, he realized that all his dreams for creative upcycling could come into fruition. Instead of dropping big bucks at IKEA, he gradually furnished his entire home with found treasures. 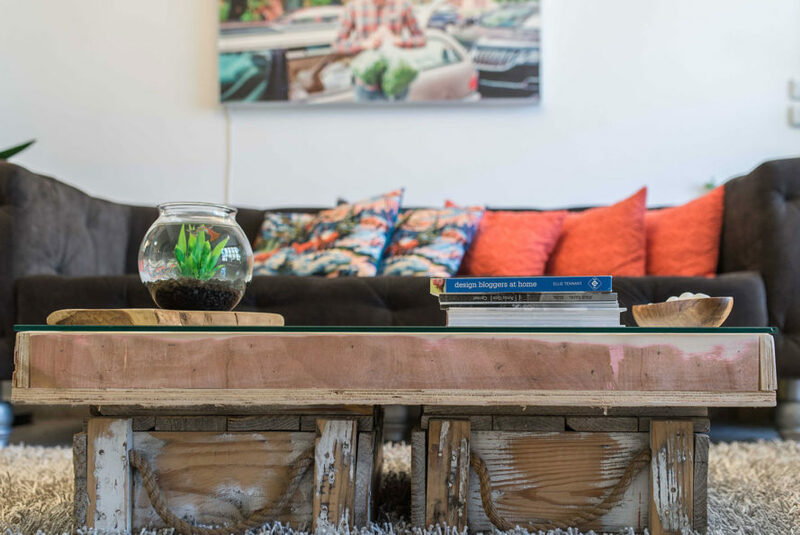 He fashioned a coffee table from abandoned wood scraps and a piece of glass, replete with draw storage and rope pulls. Wall shelving was achieved with antique army boxes from and piles of old books. Kaplan went to great lengths to improve his dwelling with minimal use of new objects and materials. The kitchen seating nook was constructed from wood and adorned with kitschy antique signs. Details of Kaplan's functional kitchen nook. A personalized chalkboard wall greets visitors. A closer look at Kaplan's handmade lighting and antique art. An old box was turned into a photo frame. He even renovated his own bathroom with vintage tiles and a handmade lamp crafted from wire. A detail of Kaplan's renovated bathroom. A detail of Kaplan's bedroom. This kind of artful repurposing has the power to inspire anyone. The next time you're strolling down a city street, you may want to keep your eyes open - a treasure trove of endless possibilities awaits. Kaplan always had an eye for upcycling, even before it was a trend. He told Inhabitat, "I travel a lot around the world, and since I was a child I was creative about making things from other things," he said, "I would walk down the street and find things and think, 'What can I do with this?' It could be an abandoned tree limb, a box or even a book."